Did you know dogs sweat through their paws? 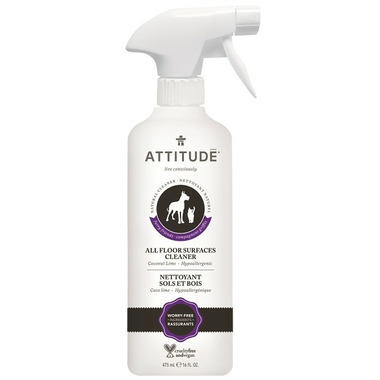 Don’t sweat cleaning up after your four-legged family members with ATTITUDE’s Natural Floor All Surfaces Cleaner & Odor Eliminator. Made from plant- and mineral-based worry-free ingredients, it’s light scent deodorizes floors without exposing your pet to harmful chemicals. Ingredients: Aqua/water/eau, caprylyl glucoside, myristyl glucoside, sodium bicarbonate, fragrance*, sodium iminodisuccinate, sodium gluconate. Directions: Ideal for eliminating stains and odors from all floor surfaces. Spray directly onto hard surface and wipe. KEEP OUT OF REACH OF CHILDREN.